He gives us everything from essential provisions, like the food we eat, to equipping power, self-discipline, and love. Because of His deep love for us, He gave us the ultimate gift of eternal life with Him through the gift of His Son. New Hope is committed to modeling this spirit of giving, and one of the primary ways we can do this is through returning our tithes to God and giving offerings with a cheerful heart. Leviticus 27:30 We are stewards, not owners, of what God has entrusted to us. Therefore, tithing (mathematical term of 10%) is bringing back what is God’s to God, and He entrusts us with the remainder to use appropriately. Giving is one of the key ways we worship God. Throughout the Bible, we see that God gave. As we seek to become more like Christ, we will grow in our giving. The Apostle Paul recognized this in the early churches and he encourages them in 2 Corinthians 8:13-15. We give ought of a love for Jesus, a desire to partner with and accomplish His mission here on earth. Give via your credit or debit card. Please contact our Church Treasurer to set up your personalized Offering Envelopes. 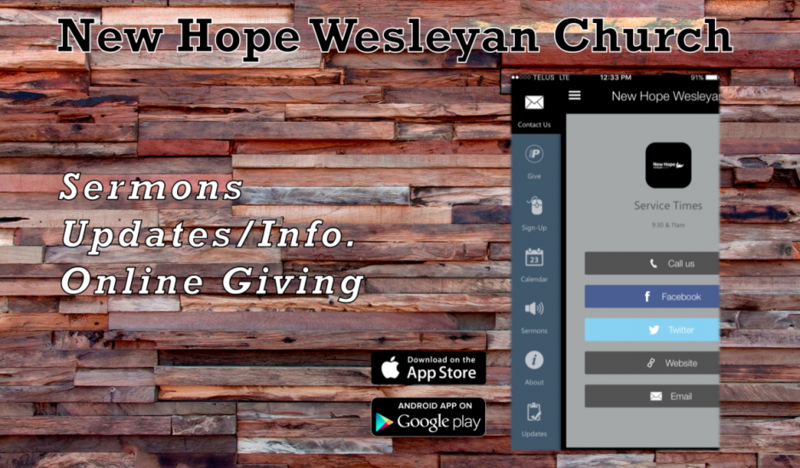 Download our App for your mobile phone.